How many of us will need a hospital admission ten years from now? More and more people are showing up at A&E and a good proportion of them are admitted to hospital for what is commonly referred to as an emergency admission. This type of admissions has increased by almost 50 per cent in the past 15. Emergency admissions cost the NHS dear and are a real burden to hospitals as they absorb resources that could otherwise have been devoted to elective care, for example to reduce waiting times for a hip replacement or a cataract operation. Last year, the NHS recorded almost six million emergency admissions to hospitals, representing around 70 per cent of all hospital bed days in England, and costing in excess of £16 billion . Similar growth in utilisation of emergency care is observed in other high income countries, despite the differences in their health systems. For instance, in the US, emergency admissions grew in excess of 50 per cent in the past 15 years to 2006 . What is driving this rising demand? A common line is that emergency admissions have been driven up by the rise in the population of over 65s, as they are the more likely users. However, when we look at the statistics, the number of over 65s has increased by only half the growth rate of emergency admissions  . Numerous studies show that demographic trends and population health are able to explain only 40-50 per cent of the total growth    . With the aim of shedding some light onto this puzzle we undertook a new study. As with many new studies, we tried to be original and look where others haven’t already. We searched for other big changes in the health system that might have a logical relationship with the use of emergency care. Without having to look too far, for too long, we found that in the past decades hospitals have achieved remarkable improvements in the survival rates of their patients by investing in new medical technologies, adopting more effective surgical interventions and implementing new policies on patient safety . A growing number of patients survive after surgery in a large number of acute life threatening conditions as documented by several studies [9–13]. However, an unintended consequence of this success may be a growing population of patients who are increasingly frail and at high risk of more hospital admissions over time. We investigated this hypothesis by using a very large dataset including nine million patients with a first hospital admission for an acute event, such as a heart attack or a stroke. We then followed these patients for up to two years from the first acute event, counting the times they were back for an emergency admission for any reason and to any hospital. We repeated this exercise in every year from 2000 to 2009 and found that, in every year, more patients survived their first admission than in the previous year, and all surviving patients experienced a greater number of emergency admissions following the first acute event. 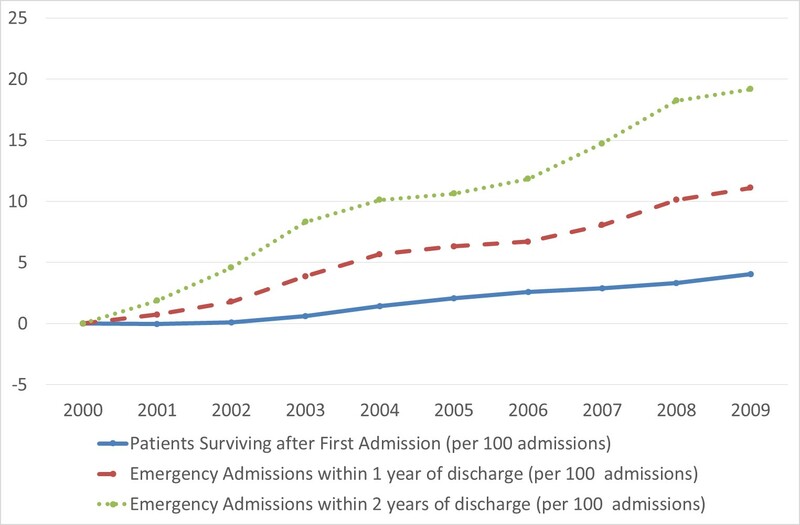 Statistical models allowed us to measure the relationship between more patients surviving and more emergency admissions occurring in the following year. We found evidence that patients admitted in hospitals with larger improvements in their survival rates experienced greater increments in the number of emergency admission following the first acute event. We quantified this effect and put it in the context of the total growth in emergency admission observed in our data between 2000 and 2009 and found that improvement in survival accounted for about 37% of the total growth in our sample. These findings have some interesting implications when applied to the whole population of NHS patients. A total increment of 1.63 million emergency admissions has been reported over a similar period of time by the National Audit Office  with a total cost of £3.45 billion in hospital services. Our analysis suggests that 426,000 of these admissions (or 26%) may be explained by the variation in hospital mortality rates, i.e. £900 million in hospital services. Source: 1. Laudicella M, Martin S, Li Donni P, Smith PC. Do Reduced Hospital Mortality Rates Lead to Increased Utilization of Inpatient Emergency Care? A Population-Based Cohort Study. Forthcoming in Health Services Research. Emergency care services of the NHS and many other health systems are coming under great strain, and there is a great need for additional resources to cope with an increasing demand for services. A sizeable part of emergency admissions and their cost can be explained by the success of NHS hospitals in saving the life of their patients. Managing and targeting the health conditions of these patients after the first hospital admission can be key in containing a large element of the rising demand for emergency services in the future. Finally, policy makers have adopted a series of measures to contain emergency admissions, following the common view that a significant share is avoidable and driven by hospitals’ financial incentives and inefficiencies. In England, the marginal rate rule reduces hospital payments to 30% of the prospective tariff for emergency admissions exceeding the hospital level of activity in past years. The marginal rate rule results in a total of £530 million lost income per year, an average of £3.2 million lost income per hospital trust . However, current policies may generate unwanted consequences for the health system, draining resources from virtuous hospitals that are succeeding in saving their patients’ lives. Dr Mauro Laudicella is a Senior Lecturer in Health Economics in the HSR and Management division of the School of Health Sciences and an Honorary Research Fellow in the Imperial College Business School and Centre for Health Policy. He previously worked as a Research Fellow in the Centre for Health Economics at the University of York. 1. Source: NHS Digital and National Schedules of Reference Costs 2015-16. 2. Schuur JD, Venkatesh AK. The Growing Role of Emergency Departments in Hospital Admissions. N. Engl. J. Med. 2012;367:391–3. 3. Source: Office for National Statistics; General Register Office for Scotland; Northern Ireland Statistics and Research Agency (ONS 2009c; 2010a). 4. Tang N, Stein J, Hsia RY, Maselli JH, Gonzales R. Trends and characteristics of us emergency department visits, 1997-2007. JAMA. 2010;304:664–70. 5. Strunk BC, Ginsburg PB, Banker MI. The effect of population aging on future hospital demand. Health Aff. (Millwood). 2006;25:W141–9. 6. Cowling TE, Soljak MA, Bell D, Majeed A. Emergency hospital admissions via accident and emergency departments in England: time trend, conceptual framework and policy implications. J. R. Soc. Med. 2014;107:432–8. 8. Wang Y, Eldridge N, Metersky ML, Verzier NR, Meehan TP, Pandolfi MM, et al. National Trends in Patient Safety for Four Common Conditions, 2005–2011. N. Engl. J. Med. 2014;370:341–51. 9. Finks JF, Osborne NH, Birkmeyer JD. Trends in Hospital Volume and Operative Mortality for High-Risk Surgery. N. Engl. J. Med. 2011;364:2128–37. 10. Krumholz HM, Wang Y, Chen J, et al. Reduction in acute myocardial infarction mortality in the united states: Risk-standardized mortality rates from 1995-2006. JAMA. 2009;302:767–73. 12. Ovbiagele B. Nationwide Trends in In-Hospital Mortality Among Patients With Stroke. Stroke. 2010;41:1748–54.